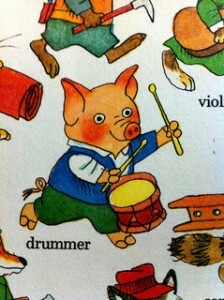 Image: Children’s author Richard Scarry’s “Busy Busy Town,” 2000. Welcome (or welcome back) to campus! The empty sidewalks of summer are quickly filling up again with students, making the Homewood campus feel like Richard Scarry’s Busytown. New and returning students and faculty are always curious about library services and resources. We will soon be busy ourselves, answering those questions. When is the library open? The Brody Learning Commons (BLC) will be open 24/7 during the academic year. The Eisenhower Library (MSEL) will be open 7:30 am – 3 am during that time. Changes for holidays, reading period, and finals are noted on our hours page. Do I need a library card? Your JCard is your library card. Use it at our Service Desk and self-checkout stations. Add money to your JCard and turn it into a copycard to use with our printer/copier/scanner multifunctional devices. I need some help! We offer online library help about borrowing and requesting materials, library events and workshops, research consultation, and instructional support . We have guides on many different topics. You can also ask a librarian a question or contact the liaison librarian who works with your department. Does the library have my textbooks? This is a frequent question, so there’s already a blog post about it. (The answer boils down to ‘not usually’.) But profs do put many readings and textbooks on reserve. We have both e-reserves and print reserves. Your syllabus will indicate if your class has items on reserve at the library. Can I access online library material from off-campus? Yes! You will be asked for your JHED ID and password. More information is here. You can also access your library account using your JHED credentials. Teaching a Summer Course? Consider Using Course Reserves!